In MacVector 12 designing your construct with Click Cloning has never been easier. There’s a stack of new features to enhance restriction mapping and choosing how to get that fragment into your cloning vector. Restriction enzyme recognition sites that appear only once in a sequence will be displayed in red, whereas sites that will be cut more than once will appear in the normal blue. This shows unique sites in your gene and vector at a glance. Highlighting of sites compatible with a digested fragment. Once you have digested a fragment all compatible sites in all Map views will be displayed to indicate that they are compatible with the digested fragment on the cloning clipboard (see the EcoRI and HinDIII sites in the vector below). Double-click on a restriction enzyme site in the Map tab to select all sites of that type. If you double click on a single site then all identical sites will be highlighted in the map. If a single base change to the sequence would introduce a new restriction enzyme recognition site then with this option turned on these putative sites will be labelled with a star. Please note that these are not necessarily translationally silent sites. That feature will be introduced in a future release. 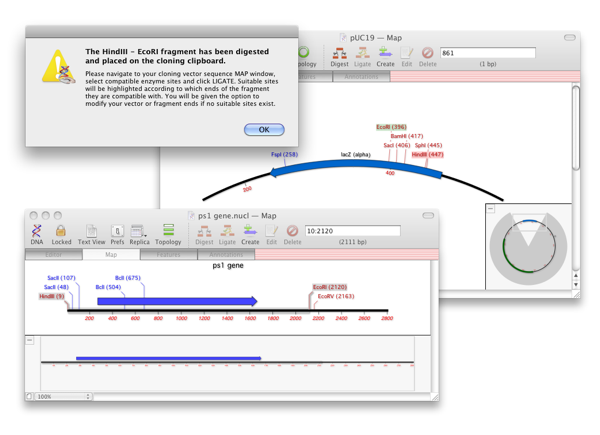 When zoomed to residue in the map view and if the sequence is displayed with the complementary strand is shown then restriction enzyme sites will be shown directly on the sequence indicating blunt or overhanging ends. When you select a fragment in the Map view and you are zoomed to show the sequence, then the exact sequence selected will be displayed including overhanging ends. 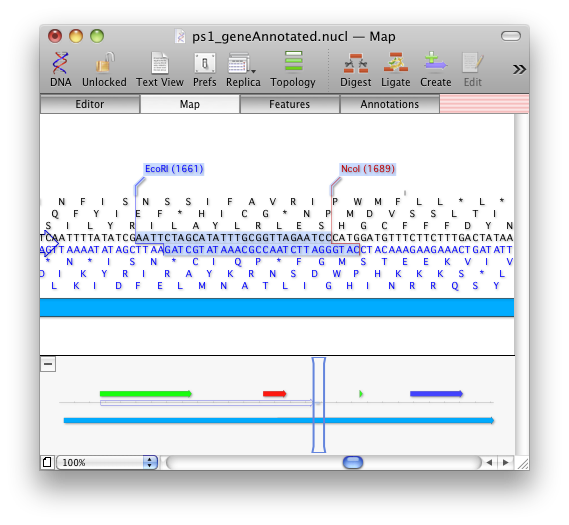 If the complementary strand is shown in the Editor the selection here will also indicate this. Digested fragment is in 5′>3′ direction between first and second sites and can cross the origin. Because selections can now cross the origin for circular sequences all fragment selections will take place in a 5′ to 3′ direction. For example in pUC19 in the above screenshot you must select the EcoRI at 396 first followed by the HinDIII site at 447. If you selected them in the reverse order the entire vector apart from this fragment would be selected. This now completely removes the problem of cloning fragments into sites that span the origin of the cloning vector. This entry was posted in Releases, Tips and tagged cloning, What's New?. Bookmark the permalink. Both comments and trackbacks are currently closed.